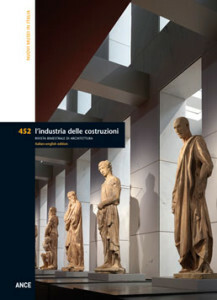 This issue presents a selection of the most recent museum projects realised in Italy. This mixed collection ranges from the design of exhibition spaces to the expansion of buildings of notable architectural and historic value, conserving equally valuable collections of art, to the reuse of existing structures and the addition of new volumes, to small interventions that heighten the value of parts of the city or landscape. Beyond the heterogeneity of the approaches and formal results achieved, which vary widely, this selection also documents a transformation that, while minute is also particularly active and focused on improving the numerous artistic and cultural resources Italy has to offer. The selection begins with four projects that stand out for the quality and elegance of the solutions proposed, in addition to the difficult challenges faced by their respective authors, who responded with intelligence and methodological rigour: the expansion of the museum of the Opera del Duomo di Firenze, the new layout of the Museo del Duomo in the Palazzo Reale in Milan, the new Museo degli Innocenti and the Scalone di ponente at the Uffizi Galleries, both in Florence. Four other projects follow: the National Archaeological Museum of Reggio Calabria by ABDR Architetti Associati, whose attentive critical reading of the history of Marcello Piacentini’s building reproposes its hidden expressive and symbolic potentialities; the new Prada Foundation by OMA in the periphery of Milan, a complex of existing buildings and new volumes that plays with contrasts between forms and materials; the expansion of the Contemporary Arts Centre in Prato by Maurice Nio and the Messner Mountain Museum Corones by Zaha Hadid, the only entirely new project. The selection is completed by another project by ABDR, in this case for the expansion of the National Archaeological Museum of Sibaritide, an intervention in an anonymous context where the architects responded with a new highly visible and brightly coloured device. 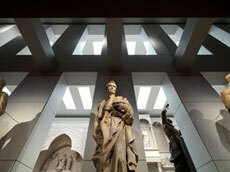 Since public opening in 1891, the Museum has conserved the heritage of the Opera del Duomo. 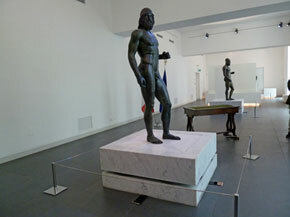 The Museum was renovated, expanded and modified on various occasions during the twentieth century. Despite the fact that its exhibition space had grown over time, the rooms were too small and the ceilings too low to properly host its collection. A radical expansion and reorganisation project was completed between 2010 and 2015. Once completed, the volume of the Museum had been more than doubled and its exhibition areas almost tripled, merging the original nucleus of the Museum with the adjacent eighteenth century Teatro degli Intrepidi. After a lengthy and carefully studied period of design, construction was completed in only 24 months and the new Museum inaugurated on the 29th October 2015. The most recent exhibition design at the Museo del Duomo by the architect Guido Canali opened to the public in occasion of EXPO 2015. In these new interior spaces, reopened by the Veneranda Fabbrica del Duomo, visitors are offered a typological and chronological look at a heterogeneous collection treasures from the Cathedral, elements substituted over time or eliminated during construction, works of art and sketches arranged in twenty-six rooms occupying a total of 200 square meters. All of the items on display are arranged in an exhibition whose primary concern was to involve the public in a spectacular mise-en-scène. Sculptures, canvases and jewellery, gathered in groups, are offered to the public in a suggestive display created by their appearance out of darkness, set against an architectural backdrop that is made to disappear. The new Innocenti Museum is the work of the florentine office Ipostudio, winner of an international competition held in 2008. While the selected project did not propose relevant modifications to the structures, it nonethenless managed to reorganise and modernise the spaces of this historic orphanage to expand the Museum’s existing exhibition spaces, dating back to the 1970s and obsolete. The first nucleus of the complex was constructed between 1419 and 1427 by Filippo Brunelleschi; over time the structure was expanded and its layout modified, including the repositioning of the entrance from the main façade to the side. 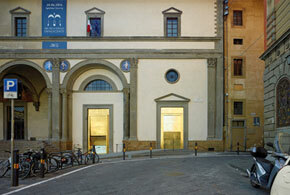 The first choice made by Ipostudio was to restore the entrance to the Museum from the main square and re-establish the original role and significance of this elevation. This restoration was an integral part of the project. The new large west staircase is a key element of the “Nuovi Uffizi” project, begun in 2003 to double the Museum’s exhibition spaces and reorganise circulation through its famous galleries. Designed by Natalini Architetti, the stair is situated in the courtyard of the Vecchia Posta, located behind the Loggia dei Lanzi and occupying almost the entire end of the west wing of the famous building designed by Giorgio Vassari between 1559 and 1581. 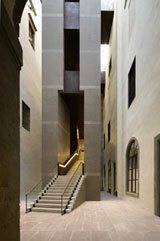 This space is occupied by the imposing mass of the large stair. Its six ramps are grouped together, set in parallel pairs and housed in a massive 16-meter long and 4,70 meter wide parallelepiped rising up in the void of the court. The stair is connected to the rear wall toward the Chiasso dei Baroncelli and flanked on both sides by two smaller volumes, one containing the lifts and the other a series of technical spaces. The new museum route provides access to the stair from the second piano nobile, passing by the terrace at the top of the Loggia dei Lanzi. At this level the stair resembles a wide panoramic plaza, from which to observe the void below and offering a view toward the Borgo Santi Apostoli and the city on the other side of the Arno River. The Riace Bronzes, two splendid bronze warriors unearthed on 16 August 1972 in the waters of the Ionian Sea, datable to the 5th century BC and presumably the work of Greek sculptors have, since 1982, been the fulcrum of the collection of the National Archaeological Museum in Reggio Calabria, designed in 1932 by Marcello Piacentini. Construction of the building dragged on until 1941 and, after a brief halt due to various vicissitudes, began again in 1950. 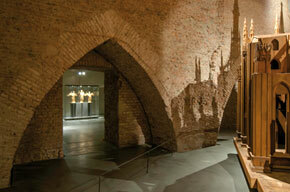 The Museum was finally inaugurated in 1958, after repairs to war damage and the fit out of the exhibition spaces. While among the very few new museums designed in fascist Italy, the building was never particularly appreciated. The objective of the new project was to restore the beauty of the building by lightening its massive appearance, recovering its original functional and expressive prerogatives, enriched by the instances and know-how of our era. More than the successful coexistence between existing buildings and new elements designed by OMA – the Podium, the Cinema and the Tower – this new complex is characterised by their integrated though intentionally fleeting relationship with a unique and all-encompassing logic of composition. 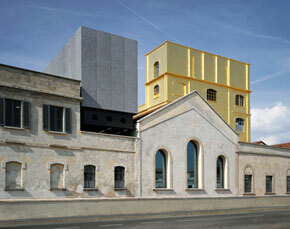 The site of the former Società Italiana Spiriti distillery has been converted into a true citadel of art comprised of articulated spaces that testify to the Fondazione Prada’s commitment to culture. From Largo Isarco an outdoor path winds between the different buildings and functions to connect the various activities offered by the Foundation. The building in the corner is home to part of the Foundation’s offices, while on the opposite side a rectangular building hosts the Library and recreational space for children. At the end of this element is the bar. Moving along the building visitors arrive in the foyer, which leads to the Podium and directly into the upper block of this element, dedicated to the exhibition of works on loan. Moving around the reception area the path continues into the temporary exhibition galleries along the south side. Situated at an elevation of 2,275 meters, the Museum is partially incorporated within the peak of the Kronplatz, in South Tyrol. The mountain is home to the most popular ski facility in the area during the winter months, while during the summer its 31 lifts remain unused. The challenge was thus to attract ski lovers during the season when there is no snow. 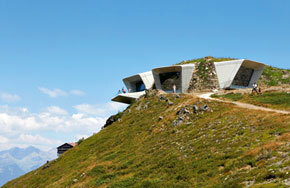 This ambitious project of dedicating a diffuse museum to the mountain – between Alto Adige and Cadore – was well suited to the creation of a centre of attraction that would take advantage of the ski lifts during the summer season. The Kronplatz is one of the satellites of the MMM, promoting the territory of Alto Adige and harmoniously integrating itself within the landscape. For Messner, the last of the six satellite museums is the crowning achievement of the museum programme because it illustrates the history, the present and the evolution of traditional mountaineering. 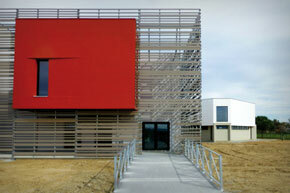 The addition features a characteristic half moon shape and a variable section that “suffocates” the pre-existing building, constantly kept at arm’s length. 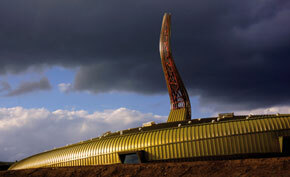 The addition has its own autonomous structure, characterised by branch-like columns on the ground floor. Where the new is grafted onto the old, the section narrows and from the interior it is clear the sensation of one volume set into another. This dialectic opposition is also evident on the exterior in the fluidity of the new and the square modules borrowed from the industrial landscape of Prato and the bracing elements of the historic building.At the urban scale, Nio’s project has the undoubted merit of having broken up the isolation to which the museum had been condemned by the project by Italo Gamberini from 1988. From the moment of its construction, visible from the highway and thus ready to manifest its presence beyond the city’s boundaries, it was unreachable by a fence crossed only by visitors. Designed by Riccardo Wallach and inaugurated in 1992, the National Archaeological Museum of Sibaritide consists of five exhibition spaces, all with the same form and proportions. They were designed to contain remains from the excavations of Sibari, Thurii and Copia and the findings unearthed during archaeological campaigns in Francavilla Marittima and Castiglione di Paludi. The halls are linked by a path connecting the two levels of the building, with an annexed wing of administrative and service spaces. The new expansion project added another generous exhibition hall, multimedia rooms and spaces for the storage, cataloguing and first urgent restorations of archaeological remains, formerly massed together in sheds erected in the archaeological area or left outside along the edge of the building.